PORTLAND, Ore. — An Oregon man was arrested this week after allegedly making online threats to kill teachers and children at a Christian school. Zachariah Peterson, 29, had been reported to law enforcement officials earlier this month after posting the threat in an online forum called General Mayhem. In his post, Peterson claimed that he had been mistreated by teachers at a Christian middle school, and that he was going to kill both them and the students at a adjoining elementary school. Last week, the FBI, the Oregon state police, and members of the FBI-led Portland Joint Terrorism Task Force descended on Peterson’s home after the threat had been reported by forum moderators. His IP address had been used to pinpoint his location. “Peterson admitted to sending the threatening online post about the school and also advised investigators that he had sent the posts from either his laptop or desktop computer,” an FBI affidavit outlines. In addition to admitting to the threatening post, investigators found four firearms on the premises, including a .22-caliber handgun and a Ruger rifle with two 25-round magazines. Peterson was subsequently taken into custody and charged with felony possession of a weapon. 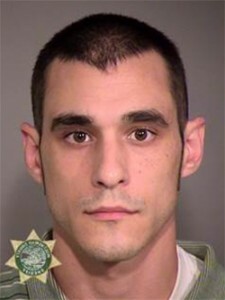 He is currently being held at the Multnomah County Detention Center on $100,00 bond. Peterson was convicted in 2007 on felony marijuana charges.